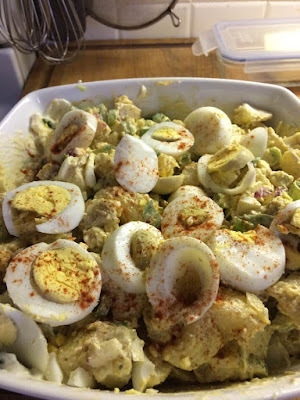 Everyone has their own way of making potato salad whether it has mayo or sour cream or both. Some people prefer Hellmann's and some prefer Miracle Whip. We're a Hellman's type of family. I've had a few people ask me for my recipe lately and to be quite honest with you I just make the salad without thinking much about it. For decades now I pretty much make it the same way or close to it depending what I have on hand. I don't measure out the spices so just make to your taste but don't be stingy. I boil my potatoes till they are fork tender. Be careful not to overcook. While the potatoes are cooking I prepare the green pepper, onion, and radishes. Once the potatoes are cooked and have cooled off enough to handle I cut them into bite sized pieces. Most times I will leave the peel off but that's just me. If you must, remove the skin. do so before chopping. In a large bowl add the chopped potatoes along with the green pepper, onion, and radishes and toss. Next add your spices tossing again. Next comes the chopped eggs, yellow mustard, relish and Hellmann's. I add the Hellmann's without measuring. Add what you feel you'd like. Give everything a really good gentle toss, add more paprika to the top along with a sliced hard boiled egg or two. love it, hint faster cooking i always chop and peel my potato before cooking. Once again my sister out does me !!! I'll have to try chopping the potatoes next time. Thanks! I have to try this recipe. I never thought of radishes in my potato salad, though I generally add a tidbit of Tabasco, so the radishes do sound good to me. Oh, I always use little red-skinned potatoes in mine. I sometimes will use Slap Ya Mama seasoning in the salad but have never thought of Tabasco sauce. Will have to try that. Perfect for the holiday weekend. Radishes is a great idea!